Some teal and white swim team reversibles with side panel pinnies are on the way to the Aqua squad in Hanover New Hampshire. 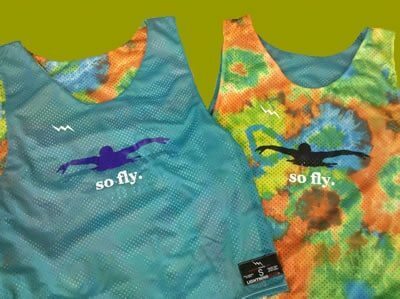 Get your swim team pinnies in a large amount of styles and patterns. The custom pinnies pictured are a basketball cut with side panels. Lightning Wear® manufactures custom swim apparel for adults and youth. Check out these very cool custom basketball reversible jerseys from Lightning Wear. Check out these bright and eccentric Sparks Youth Lacrosse Pinnies from Lightning Wear.